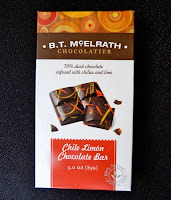 I shared today's Chile Limon Chocolate bar from B.T. McElrath (Minneapolis, MN) with a friend. We both experienced a spicy chili and cayenne pepper kick; however, he experienced grains of salt and I did not. That is the challenge with sprinkled on flavor additions; some flavors may be more unevenly distributed than others. This bar was made with 70% dark and milk chocolate; decorated with colorful red and yellow-orange swirls; and infused with chilies and lime. Today was Day #2 of Chocolate and Lemon* Theme Week. 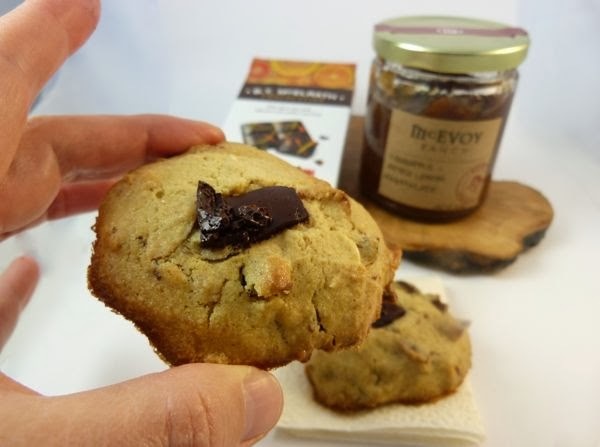 *To arrive at a true chocolate + lemon item with chocolate, I made a small batch of gluten-free lemon, almond cookies (with Crabapple Meyer Lemon marmalade from McEvoy Ranch) that were topped with bits of today's bar. 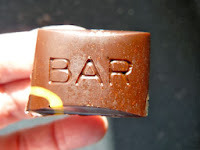 I enjoyed these a lot, but as I mentioned yesterday, I am very fond of most lemon and chocolate combinations.